Founded in 1949, Falkenbergs Golf Club had to move from its original, Rafael Sundblom-designed 9-hole seaside course (on what was then the north side of town) in the late 1950s to make room for expanding industry. In 1961, nine holes on the current woodland site at Skrea came into play, followed by a second nine in 1968, which Nils Sköld designed. The club expanded to 27 holes in 1985 after Jan Sederholm laid out the extension. Four holes on the 18-hole course are by Sederholm (2, 3, 13 and 14) as well as six holes on the 9-hole layout. The current 18-hole course dates from the late 1990s, when the first par three hole was scrapped to make room for an expansion of the driving range and was replaced with the current par three 8th by Tommy Nordström. One of the drawbacks of the site, the long walk to the first tee, is partly a result of this latest change in routing. However, once on the first tee the visiting golfer is rewarded with perhaps the best vista on the property, towards the inland forests in the distance. The same visitor is probably also grateful that the late 1990s reconfiguration changed this hole from a narrow, 400-metre, stroke index 1 par four to a slightly longer but wider par five, reachable for long-hitters in two with the prevailing westerly wind. Falkenberg's personality and trademark difficulties are revealed on the following two holes. Hole 2 is a narrow, longish par four with a small green that is difficult to hold other than with a perfectly judged iron shot. Hole 3 is a dogleg right where the drive needs to be positioned correctly to give a clear approach to the green. The rest of the round is full of similar challenges. 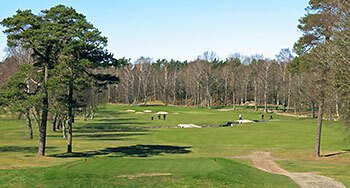 At slightly more than 6,100 metres from the tips, Falkenberg is not a long course by modern standards, but the requirement for positioning from the tee and accurate approach play into the small greens still provides a challenge for all levels, which is why the course has consistently been rated in the Swedish Top 50. Although blessed by sandy soil, the course is built in an area containing old inland sand dunes and the club is not resting on its laurels. A multi-year master plan has been created by Caspar Grauballe to develop the course further. In 2014, revised holes 4 and 7 opened for play, featuring new, more challenging bunkering and a stream across the 4th fairway forcing many players to stop and think also about strategy on this tee. The 9-hole course, open for pay-and-play, is maintained to a similar quality and is an alternative if the main 18-hole layout happens to be busy or closed for competition. Falkenberg neither has the cachet of nearby Tylösand with Halmstad GK's flagship North Course, only slightly more than half an hour's drive along the coast to the south, nor the price tag that comes with it. Many of the aspects that make people wax lyrical about Halmstad are also true about Falkenberg: firm sand-based turf, challenging tee-shots into narrow woodland corridors, exacting approaches into small greens. Many of the critical points are also similar: lack of length, too many dogleg holes, flat bunkers which provide limited challenge. "Poor man's Tylösand" has therefore been a slightly unkind, but not wholly inaccurate description, not only of the golf course but the whole seaside town itself. Whether that is true to you or not, you can do a lot worse than spending a sunny summer's day at Falkenberg's beach at Skrea with a round at its nearby golf course. Pleasant return to Falkenberg, a couple of years since I last played it but still remembered the course fondly. I was eager to see the results of the ongoing improvement program, and I wasn't disappointed. The upgraded 4,7 and 18th hole plays and looks consistent with the rest of the course, and bodes well for the future improvements. I particularly liked the 4th, visually very pretty with the crossing brook and the nifty stone bridges, the new style of greenbunker lurks in the distance and help create interesting lines of play. The rest of the course, well, Falkenberg is fairly wide, but there are a few quite tricky doglegged holes and the fairways are lined with lovely trees, and it always amazes me how the relatively few trees has the ability to end up just in front of my next shot. Had a couple of minging drives, and for some mysterious reason I had to contend with shooting over, under or around a lone tree, maybe that's the secret of Falkenberg, be straight and enjoy the variations in lines of play, or, enjoy the challenge of the recovery magic that will be required, maybe it is the trees that are well placed?